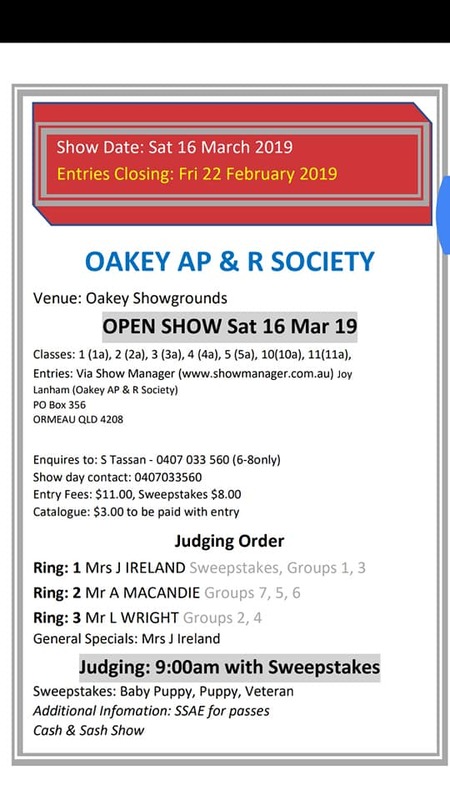 This Feature Show is the Oakey Agricultural show up on the Darling Downs, and is a Championship show (not an Open show as printed in the schedule). Rosettes for Best of Breed for Belgians are sponsored by Belgian Shepherd Dog Club of Qld. Mr Alan MacAndie, the Belgian Specialist judge, has been involved in Belgians in the UK (part of Niavana kennels UK) before immigrating to Australia many years ago. Get your show entries in to support this Specialist judge via www.showmanager.com.au Spectators welcome, but there is a gate entrance fee to be paid to get into the Ag Show. It is a great little country show with cows, tractors and horse events, as well as the dog show.